Part of a series of unique events combining the skills of Amy Blount Dressage and Kim Glover Personal Trainer to help you set goals and achive them, using fitness, strength and conditioning. 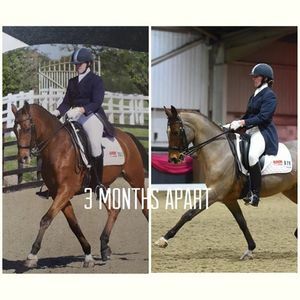 First you will do a 30 mins session with Amy on your horse working on your position and how you can maximise your horses performance through some small positional changes. There will the be a short break for you to put your horse away where after you will then have a 30 miniute session with Kim to access your strength and weaknesses and set goals. Kim will go through some exercises and give you some ideas for fitness programmes to help develop your weaker areas. You will be given a feedback sheet with info from both Amy and Kim to take home and work on. All this for £50 (including arena hire) There is also a small booking fee which makes it a total of £53.89. Book your space via Eventbrite. Anyone can attend this clinic even if you haven't done so before so you can develop and strive to your goals over the winter - coming out of the winter better prepared for the season ahead! Refunds will be given with 24 hrs notice.